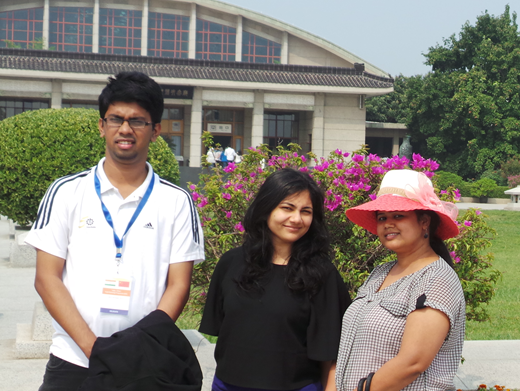 Recently, three IIMK students Amrita Thakur, Deepika PV and Siddhart Das got an opportunity to be a part of the Youth Delegation to China led by Ministry of Youth Affairs & Sports, Government of India. In this article they share their experience of visiting China. 2015 Indian Youth Delegation was the first expanded delegation following an understanding reached between the two countries during Prime Minister Narendra Modi’s visit to China in May this year. The main purpose of the visit was to promote mutual understanding of values and culture, develop better relation between India and China amongst the youth and introduction to economic and social activities about the country. Besides this, it also had elements of educational value, meeting with economic and industrial personages, entrepreneurs and interactive sessions with Chinese Embassy, President of the All China Youth Federation and NGOs. We landed at Beijing on 20th August. Stories about the Chinese capital being infamous for heavy smog and pollution, creating discomfort for city dwellers, surprised us when we landed in a lovely weather at Beijing. Credits to the China’s administration and institutional structure for implementing innovative and experimental strategies who have undertaken drastic policies to control the pollution. Some of which include around 4 lakh older cars denied registration last year, restricting vehicles on certain days of the week based on license plate numbers and other transport demand management strategies. Representing our country was an honor and a great experience. We learnt what it means to be responsible and represent our country. At our meetings, workshops, recreational and cultural activities, we participated to become more integrated and to get to know one another better. We got an opportunity to visit the Chinese automobile industry, Fast Gears. We saw their application of 3D printing driving way for their next leap in automobile industry. We also visited telecommunication company Huawei and learnt how Chinese government was working in tandem with the telecommunication giant to develop technology solution for various Government endeavors. Some of us even got a chance to visit the e-commerce giant, Alibaba at Shanghai. We visited places at Xian where Government is replacing small rural homes with high-rises providing the landholders apartment free, tens of thousands of dollars for their land and skills for employment. We also got a chance to visit some of their cultural places like Forbidden City, Great Wall of China and Terracotta Army. The trip ended with a beautiful cultural night at Guangzhou organized by the Chinese authority.